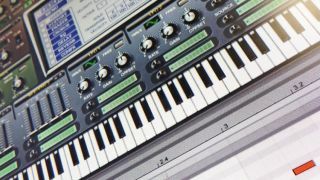 Sylenth1: a synth worth raving about. The Roland Alpha Juno synthesiser's factory 'What the' preset shot to fame through its use in rave classics such as Second Phase's Mentasm, The Prodigy's Charly and Human Resource's Dominator. Its distinctive buzzing timbre can be attributed to the Alpha Juno's LFO-modulated PWM sawtooth and unique Roland chorus. Sylenth1 is possibly one of the best synths around for recreating this classic sound - just take a listen to the 023: HOV Dominator preset. So, in this walkthrough, we'll synthesize a hoover from scratch. For more on Sylenth1, pick up Future Music 284, which is on sale now. Step 1: To create the foundation of a hoover patch, we stack up four sawtooth oscillators, with their pitches tuned across several octave ranges for maximum thickness. All the oscillators have their Retrig buttons turned off, and a maximum eight unison voices are applied to each. Step 2: Each oscillator's eight voices are heavily detuned against each other via the Detune parameter, then the fine tune of each oscillator is shifted up or down a touch for more thickness. The plugin's built-in EQ is applied, adding a bit of sizzle to the sound's top end. Step 3: Modulate the pitch of oscillators 1 and 2 via the modulation envelope, tweaking the settings to shape the hoover-style pitch fall. We rearrange the routing of the oscillators, beefing up our signal through filters A and B. This drives the sound hard to give a crunchy hoover tone.